with JAL Touch & Go boarding flow. Web or airport check-in is no more required. Boarding JAL domestic flight in Japan is simple and quick. Just scan your 2D barcode or IC card at the security checkpoint and boarding gate to fly. This is JAL's smart and innovative Touch & Go boarding. After you book the domestic flight, purchase the ticket and select the seat, you will see a "Touch&Go" icon in the Passenger-boarding information section on the Booking Details page. 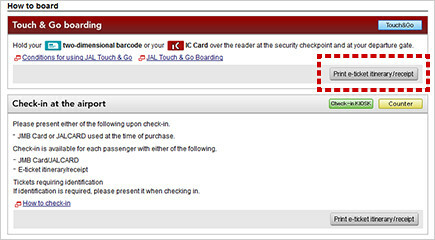 This indicates you may use JAL Touch & Go boarding. *Touch & Go boarding is not applicable to codeshare flights. You may access to your domestic flight booking from below and select your seat. It indicates the conditions of using JAL Touch & Go boarding are not fulfilled. If you have not selected your seat, Touch & Go boarding will not be applicable. Once your seats have been selected, the "Check-in KIOSK" icon will change to "Touch&Go". Please have one of the following items (2D barcode for your flight or your JMB card/JALCARD) on hand. Simply tap your JMB card or JALCARD for boarding. Obtain the 2D barcode on the Booking Details page after completing your flight reservation, ticket purchase and seat selection. This service is integrated with Osaifu-Keitai® function. Once the app is set up, you may use the service even if the Smartphone is turned off. Save and manage the 2D barcode pass on iPhone Wallet (Passbook) app. You may check your domestic flight booking and travel information with this app. The 2D barcode can be printed out from the Booking Details page. 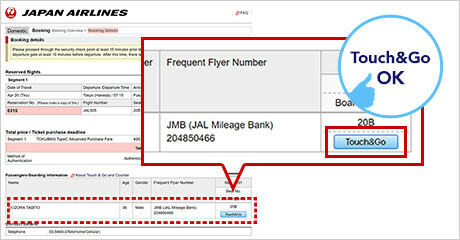 You may access to your domestic flight booking via JMB member login or entering your Reservation Number. 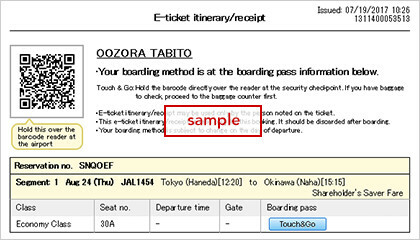 Select the Print e-ticket itinerary/receipt button on the Booking Details page. Choose the passenger name and select the Print button. *If you have already obtained the e-ticket itinerary/receipt from the ticket counter (city/airport) or travel agent, it is not necessary to print again. *One barcode is issued for one passenger. The barcode is non-transferable. *JMB members may also print out the 2D barcode. *Although it is not obligatory to reacquire the 2D barcode after you change the booking, we recommend reacquiring the most updated one before departure to ensure that the most up-to-date information is shown. 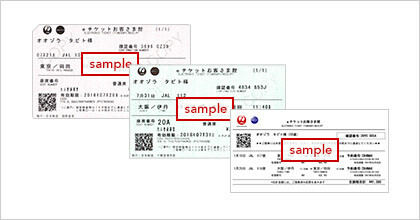 In case the Reservation Number is changed, it is necessary to reacquire the 2D barcode. Even you are connecting from a domestic flight to another domestic flight, you may use JAL Touch & Go boarding. Your connecting flight information will be also listed on the Boarding Information Slip issued at the security checkpoint. Please go straight to the boarding gate of your connecting flight at the airport. You may use Touch & Go boarding regardless of whether your flight reservation record for the connecting flight is separate or not. Touch & Go is not available in the following cases. Please notify the departure gate staff at least 15 minutes prior to the departure time of your connecting flight. If the reservation includes a child at the age of 7 or below, and the reservation record for the connecting flight is separate. 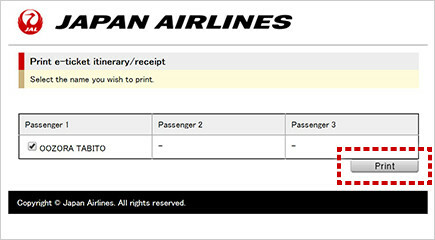 If using a certain connecting flight departing from the Okinawa islands and the reservation record for the connecting flight is separate. If you have more than one bookings for connecting flights departing from the same airport on the same day. To use Touch & Go boarding, please make sure to include your connecting flight within the same reservation record. 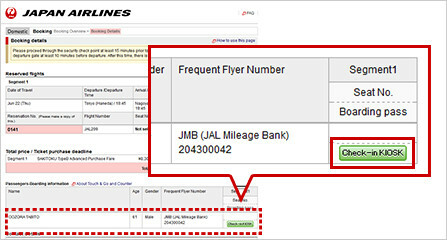 No additional web or airport check-in procedure is required for boarding JAL domestic flight. Simply walk through to board your flight if STEP 1 (flight booking, ticket purchase and seat selection) has been completed in advance. After arriving at the airport, walk through to the security checkpoint. It's not necessary to stop by the check-in counter. Scan your 2D barcode or tap your IC card (JMB card/JALCARD) over the reader at the security checkpoint to receive the Boarding Information Slip. Boarding information including flight number, seat number and boarding gate will be printed on the slip. Please check in your baggage at the airport counter before proceeding to the security checkpoint. Please check the rules for what you can carry into the aircraft beforehand. 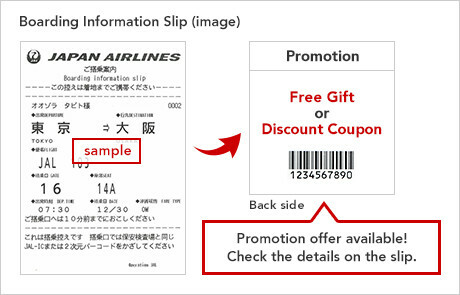 Receipt can be obtained through JAL website, or the Self service check-in and ticketing KIOSK at the airport. After issuing the receipt from the Self service check-in and ticketing KIOSK, you may proceed to the security checkpoint for boarding. *For smoother scanning, please ensure no fold over the 2D barcode (e-ticket itinerary/receipt) on the printout. *To re-enter the security checkpoint, please present the Boarding Information Slip that you received upon your first security check. *Touch & Go boarding is not available at some airports or specific boarding gates. *Passengers who arrive at the security checkpoint less than 15 minutes before departure time may not be accepted for boarding. Please scan/tap item at the security checkpoint and boarding gate. How can I use Touch & Go boarding if I am traveling with an infant? 2D barcode for the infant will be printed on your Boarding Information Slip. *Passengers who arrive at the boarding gate less than 10 minutes before departure time may not be accepted for boarding. I have baggage to check-in, can I use Touch & Go boarding? Who can use Touch & Go boarding? Can I print my 2D barcode more than once?